Both In and Out of the Ring. Bonus Materials Including Panel Discussions and Interviews with Top Names in Wrestling Included in DVD Package, Available at Walmart and Other Select Retail Outlets. Nashville, TN – Known by fans as “The Million Dollar Man”, Ted DiBiase made a name as one of the original and most enduring villains of pro-wrestling. His dynamic persona helped popularize pro-wrestling as an entertainment empire, and thrust DiBiase into the international spotlight. His mantra that “Everyone has a price” became self-prophesying as his personal life quickly spun out of control. 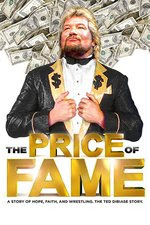 Tomorrow, April 10, “The Price of Fame,” a documentary chronicling the rise, the fall and the redemption of this wrestling legend, will release on DVD after a successful theatrical and VOD campaign. With distribution through Ocean Avenue Entertainment, “The Price of Fame” will be available at Walmart, Lifeway and other select retail and online outlets. Originally launched as a Fathom Event, “The Price of Fame” premiered on over 500 screens in November of 2017. Since that time, the film has been a top documentary on both Amazon and iTunes, and boasts over 4.6 million trailer views on Facebook. A second-generation professional wrestler, DiBiase set out to make his own mark in the sport. His adopted father, “Iron” Mike DiBiase, was one of the pioneers of the genre, who passed away suddenly after suffering a heart attack in the ring when DiBiase was only fifteen. After years traveling and building his own reputation in the emerging sport, DiBiase was given the “Million Dollar Man” persona that exploded his personal career as well as helped expand the sport as a whole. Told as a father-son story, “The Price of Fame” was created by filmmaker Peter Ferriero and Ted DiBiase Jr., who followed his father and grandfather’s legacies and achieved his own success in the WWE. Ted Jr. journeys through pro wrestling’s past to try to grapple with his father’s story, and to re-ignite his own faith and re-commit to his role as a husband and father.